I spent a large part of Sunday roaming the halls of NYCC 2015 for the final time this year, just hungover enough to feel my inner Raoul Duke but sober enough to have chats with Babs Tarr in the morning and Scott Snyder and Greg Capullo in the afternoon. I met all three of these awesome Bat-creators at last year’s con, and it was nice to catch up with them about their latest and greatest. Those interviews will go up at my day job at some point this week, so stay tuned. Babs Tarr is a sweetheart, one of my absolute favorite artists working in comics right now. Batgirl is amazingly her first comic book, which makes her accomplishments (she was nominated for an Eisner this year) all the more impressive. We talked a lot about how she felt about her work inspiring a new term in comicspeak: “Batgirling,” which is what happened to a lot of DC’s line of books during the June relaunch. Many of the new titles, like Omega Men, Dr. Fate, and Black Canary feel much more creator-owned, modern, diverse, and concerned with today’s issues. Cameron Stewart, Brenden Fletcher, and Babs have been at the forefront of that movement since Batgirl #35. Happy to have them. I always get very nervous when I talk to Scott and Greg because they’re artists I admire greatly. In no small part the reason why I got into Bat-comics. But once I start talking to them, I’m never sure why my leg was shaking in the first place. Scott and Greg are two of the most humble people I’ve ever met. When they’re not answering questions, they’re shooting jokes at each other and the eager fans waiting to have their books signed. At one point, Scott was doing a solo interview and Greg stepped out of the press area, which is cordoned off by publicists, to sign as many comics as he could. He also told some of his fans a really funny story about some work he did overseas that I didn’t quite hear completely. So I won’t butcher it. But if you ever run into Greg, ask him to tell you a story. Scott is a bit more quiet, perhaps even a little tired-looking, but that’s probably because he’s writing Batman, American Vampire, Wytches, a new OGN with Jeff Lemire, and overseeing the new Batman weekly. Plus, he brought his family with him to the con, so time he didn’t spend with journalists or on panels, he spent with his kids. For that matter, Greg’s wife was sitting in the press area, too, and she was laughing and shaking her head at all her husband’s antics. The beard was Scott’s idea. Greg joked about the time Scott sent him a picture of a beard as an example of what he envisioned for Bruce’s whiskers. Greg always gets a kick out of telling that story. One thing that’s very evident between these two is that they’re so obviously buddies. I can see how they might have clashed at first (which they did at the very beginning of their run), exchanging passive aggressive emails with each other, but it’s understandable. Greg has a strong personality (just follow the guy on Twitter), and Scott is always a bit on edge it seems—not because he’s a headstrong writer, but because Batman is a scary and deeply personal thing for him. The guy is climbing Mt. Everest, full of Jokers and Owl assassins waiting on every cliff, every time he sits down to write a new story. And Greg is the guy smoking a cigar alongside him having the time of his life. That is my impression from what they’ve both said in interviews and on social media. Overall, their dynamic absolutely works. Which is why I’m nervous about Greg’s departure from the book after issue #51 early next year. Scott and DC co-publisher Dan DiDio both called it a “short break,” and that Greg would return after he wraps up an untitled project with Mark Millar. (I asked Greg if the new project had a title. He responded, “No, it doesn’t. But I wouldn’t tell you if it did.” Fair enough.) When I asked Scott if he had a shortlist of artists to fill in for Greg during the break, he said, (and I’m paraphrasing a bit because I haven’t transcribed the interview yet) “I don’t want to think about that right now. I just want to celebrate what Greg has done on the book.” Which is such a beautiful testament to his friend, but also sort of heartbreaking. Why? Because I’m a little worried Greg won’t be back to the book. I know, I’m fear-mongering. In no way do I think the partnership is over, of course. Scott and Greg have teased in the past that they’d always do stuff together no matter what. I think Greg’s break is more about not being nabbed back into a binding contract that makes him completely exclusive to DC. There’s a lot I’m sure he can contribute in other corners of comics. Scott and Greg have previously teased that they’d like to work on Greg’s creator-owned book, The Creech, which the artist previously wrote and drew for Image. Greg likes to draw monsters. I’d read it. I might even pick the old books up soon. His work reminds me of Moebius in a weird way. Scott and Greg have worked on Batman in the past on one of my favorite Bat-stories ever. It was a little short story for the special Detective Comics #27 from a few years back. 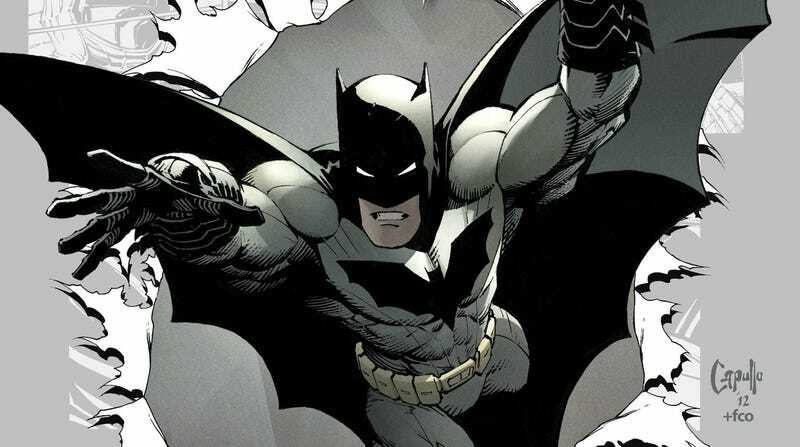 Scott wrote what he considers the finale to his Batman run (he says that he once had a conversation with Grant Morrison, my idol, about how every Bat-writer has an ending to their specific story with the character). The story is too good to spoil here, and Scott has even followed through on it in his latest arc. It’s called “Twenty-Seven” and you should absolutely search for it far and wide, as it’s one of the key chapters in Scott’s run. And that’s all anyone really needs. PUT THIS GUY ON THE BOOK PRONTO. Interviews up at day job later this week. More soon.